Sorry for the late posting... I thought, that I had already pre-scheduled my card to go live..ooops!! That just goes to show you what kind of week it's been!! So my card today, I am really played with my stamps. 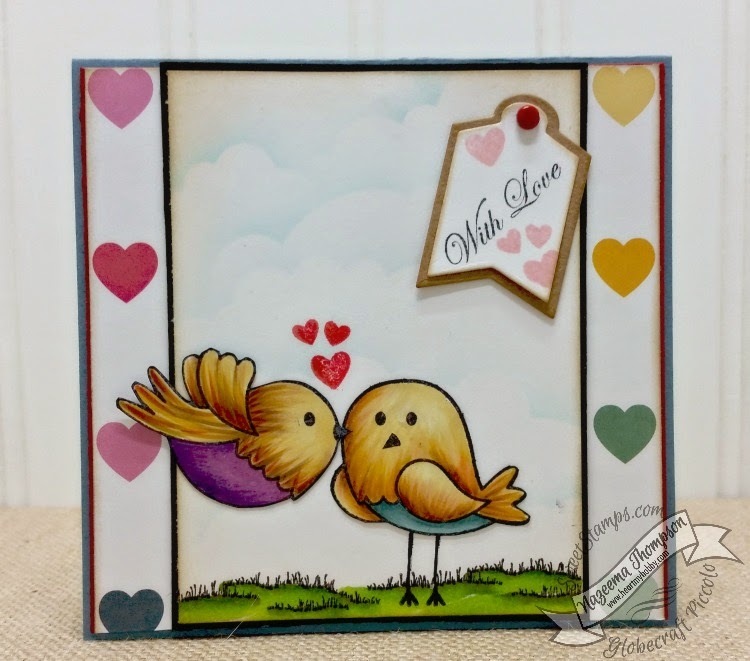 I am using the two biggest birds in the "Tweethearts" stamp set. I extended the legs on the one bird, so that his rump wouldn't be sitting on the grass. I created my subtle cloud background using Broken China distress ink. Then I stamped "Grassy Hill" and colored using Copics (YG97, 17, G14, 43). Using a post it note, I covered the top part of the bird, and stamped just the legs. I cleaned off the stamp really good, reinked just the body of the bird. Then using a ruler and Memento Tuxedo marker, I connected the body to the feet!! I fussy cut the next bird out and positioned it so it looks like it's giving a kiss, or rather a peck!! Really like the way it all came together and I hope that you do too. Thanks for stopping by today!! See you soon. So pretty~ love the copic coloring you did and your new blog design looks great! Those birdies are just wonderful, so cute and colored so sweetly! Your shading is marvelous! Great cloudy skies too! Hope you have a great day today! Just darling! I love all of the masking and your cheery colors!